"Sometimes fantasies are paths to realities." Walter Isaacson is no stranger to telling the stories of genius. Through his writing about such great minds as Albert Einstein and Steve Jobs, Isaacson has gained an understanding of the qualities that these men have mastered. In particular, he notes that the merging of arts and science seem to hold the key in these peoples' success. In his latest book, Isaacson details the life and accomplishments of a man of unparalleled genius, Leonardo da Vinci. Because da Vinci kept meticulous notes in his notebooks, Isaacson had a wealth of first-hand information about him. As such, the book is a dense portrait of the life of of Leonardo. At around 600 pages and full of illustrations and photographs, the book is quite the undertaking for both the author and the reader. For those willing to spend the time reading it, however, the book is an extremely insightful and rewarding experience. I came away from it with a much greater understanding and respect for the variety of crafts and disciplines that Leonardo mastered. Isaacson gives Leonardo's masterpieces plenty of page time, but focuses more on the works that we often don't know about. Perfectionism combined with an unyielding curiosity caused many of Leonardo's projects to either remain unfinished or be completely abandoned in favor of something different. Beyond his art of paintings, sculptures and theatrical productions, Leonardo spent considerable time studying engineering, anatomy, and other sciences. This wide variety of disciplines caused his art to inform his science and his science to inform his art, a combination that only further cements his genius. In the end, Isaacson argues that the unfinished ventures of Leonardo provide a clearer picture to the magnitude of his genius. While I certainly was curious about all of Leonardo's creative endeavors, it was his personal life that kept me invested into this book. 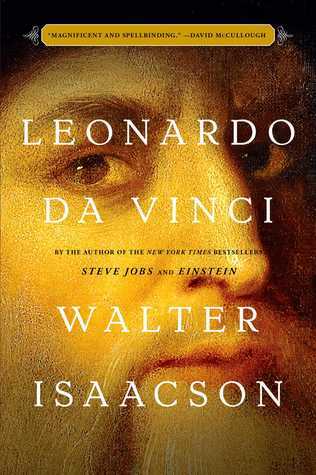 Isaacson writes of Leonardo's outsider status and mentality. As an illegitimate child and unabashed homosexual, he never really escaped this perception of himself. Even when his acclaim as an artist placed him in the company of royalty and affluence, Leonardo couldn't shake this mentality. Frankly, he was more interested in investing time in his studies than gaining the approval of others. As I've already mentioned, Leonardo da Vinci is a thick book that will require a good investment of time to properly read it. Fortunately Walter Isaacson presents the story more as a narrative than a textbook. This was a wonderful change of pace from my normal reading habits. If you are looking for non-fiction that doesn't feel like the typical history book, Leonardo da Vinci is a perfect start. I came away fascinated by the achievements and riveted by Leonardo's humanity. This entry was posted on Wednesday, January 17, 2018 and is filed under Art,Biography,Book Review,History,Leonardo da Vinci,Nonfiction,Walter Isaacson. You can follow any responses to this entry through the RSS 2.0. You can leave a response. I'm not a fan of nonfiction, but would enjoy a book like this for reference. It actually lends itself to reading in short spurts, so that make make it a bit more manageable. It sounds fascinating, especially since the writer tackles Leonardo himself and not just his works and studies. Enjoyed your review, Ethan. It really was a nice balance between the man and the masterpieces! This sounds wonderful. I like a good nonfiction tome once in a while. I really do! I love learning new things. I will have to suggest this to my other book club that focuses on larger reads. Thanks! I think you'd really enjoy it. There's definitely a lot to discuss with a book club.